Birthdays should be memorable. For my fiftieth, I bought my first pair of running shoes and entered a half marathon. The exhilaration was nothing short of monumental as I crossed the finish line and learned powerful lessons about myself and my limits. I wasted the first half of my life thinking I couldn’t run 13.1 miles, silly me. 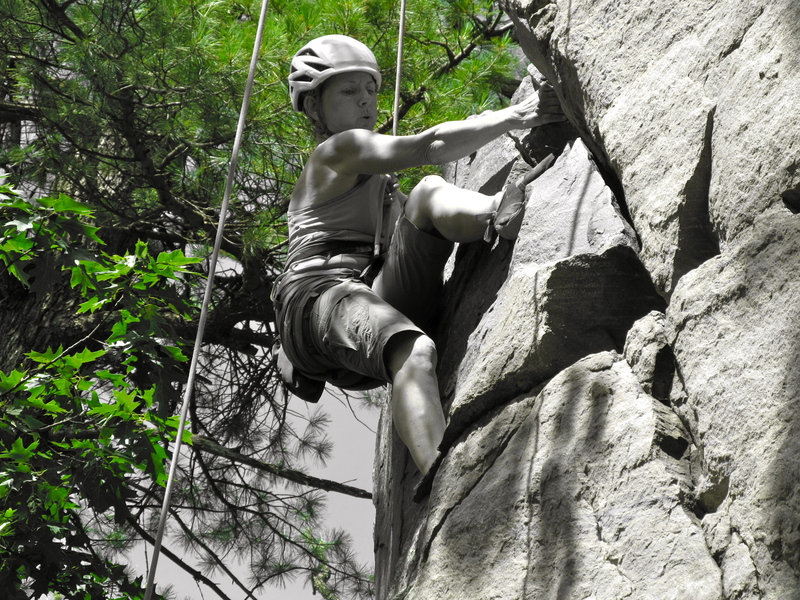 Even a smooth-looking wall has tiny ridges you can balance on with rubber climbing shoes. Finding them is the challenge! Fast-forward to birthday 2013. Fifty-seven isn’t a special number, but there is no good reason to wait for the Big Ones when splurging on oneself because, in case you didn’t notice, life is hurtling at breakneck speed from birth to death. 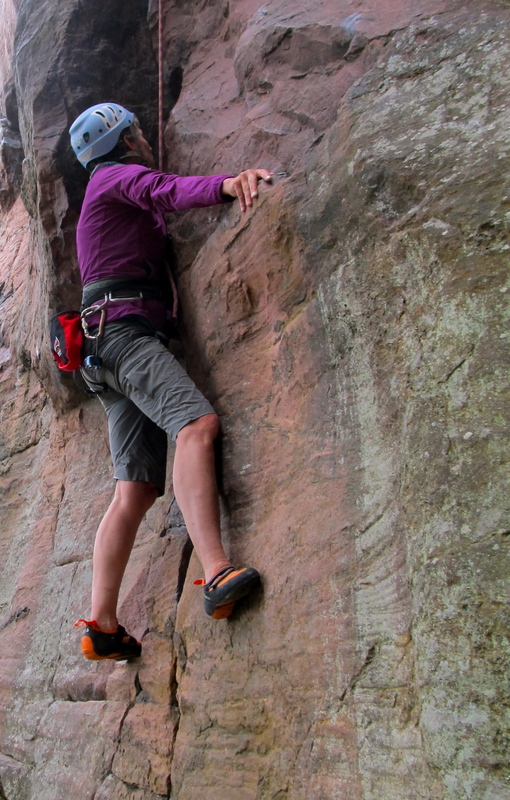 I’d heard of “Chicks Rock!” climbing clinics for women, and one was happening a couple hundred miles from my home ON my birthday weekend. It was a no-brainer. I signed up. Take four expert women climbers as guides, add fourteen women from all over the country — teen-aged to my age, beginner to advanced — mix in some rain, polished quartzite rock, crackling campfires, sprinkle in lots of laughter and encouragement plus a modicum of bruises and scrapes, and you have a mighty fine 72 hours. MIGHTY fine. Most of you would not find delight in perching on a centimeter-wide lip of rock, groping for invisible hand-holds. But… what if you tried just one new thing today? 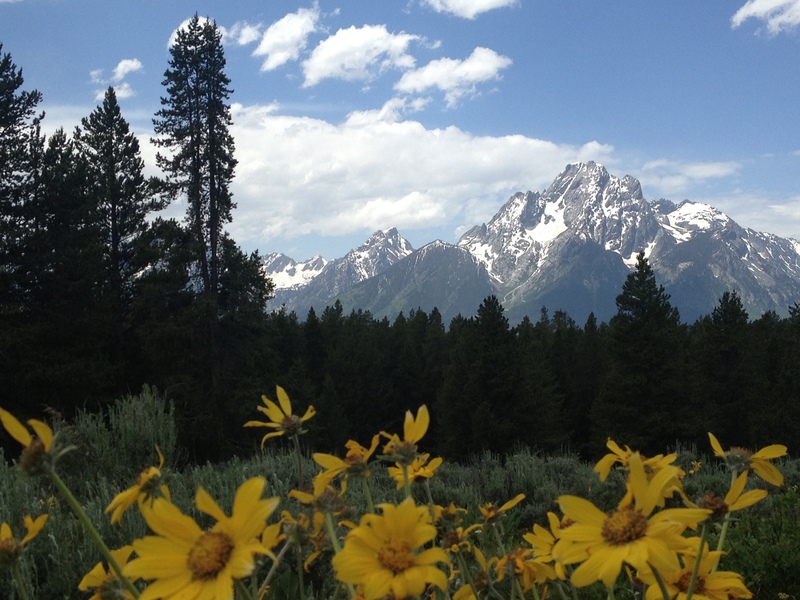 Arrowleaf Balsamroot in full bloom sets off the Grand Teton range in mid-June. So goes the quote attributed to Augustine of Hippo. Whether he really said those words or not, I’ve been unable to verify, but I resonate with the thought behind them and find that I become restless if intervals without travel occur in my life. Preferably travel with plenty of unknowns: where you’ll end up, what the weather or road conditions may be, whether campsites will be available, what wildlife might be encountered. The rugged, ragged edges of such adventures are what thrill me. 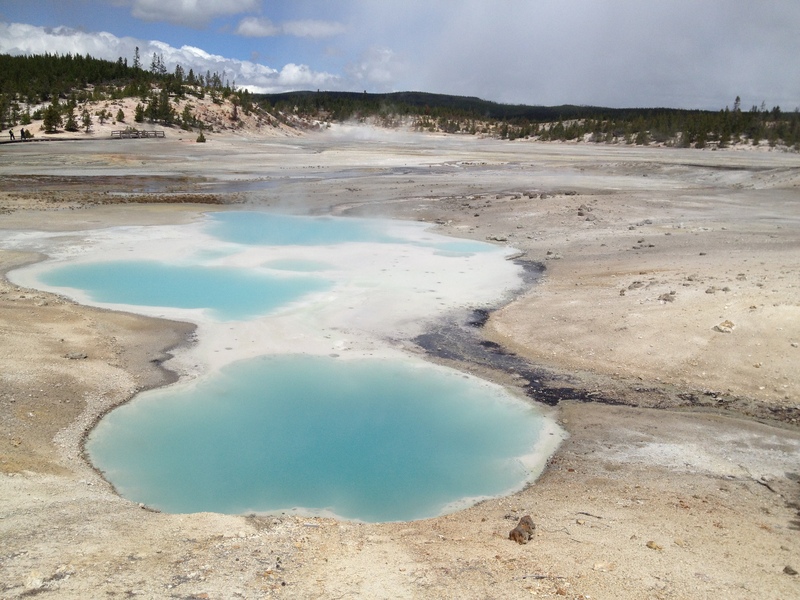 Geothermal features galore are to be found in the Norris Geyser Basin area of Yellowstone National Park. As Chris and I studied the Lonely Planet guide for the Canadian Rockies, and dreamed of heading to that beautiful country, we couldn’t have known that it would snow on us in Yellowstone National Park in late June and rain on us every day for a week north of the border. That hardly anybody sells block ice in the area we visited. That my credit card number would be stolen at a petrol station in Kootenay. That campfires (as American a tradition as apple pie) cost $8.80 each in Canada. Or that a persistent toothache would muck up the last days of our trip. We also couldn’t have predicted that we’d travel during peak wildflower bloom and maximum waterfall volume, hike our way to the top of a couple of mountains, and have at least seventeen wonderful experiences for every not-quite-wonderful one. We’d also learn to say “eh?” and pronounce the word “about” differently after spending nine days among the friendly, helpful, delightful people of Canada. You? Grab a travel magazine at the library. Type in a new destination on Google. Maybe it’s time to read another page of the world. 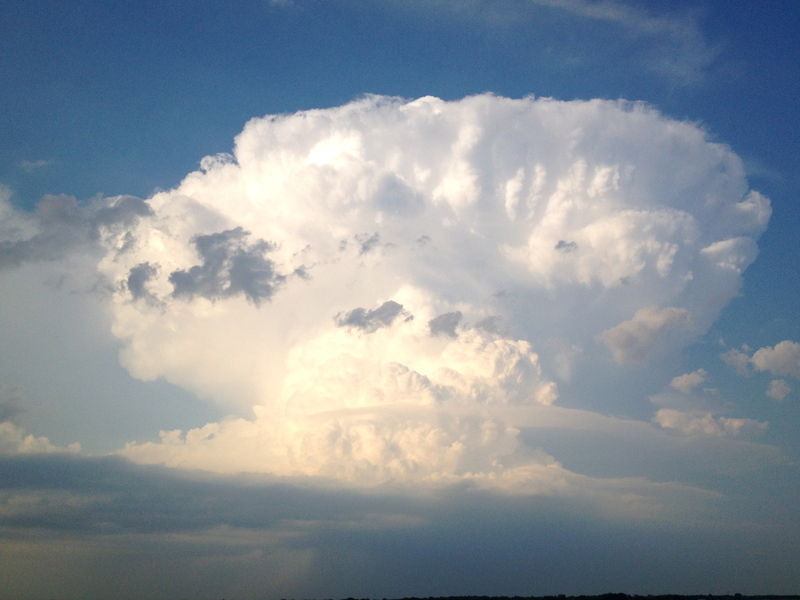 A towering cumulonimbus cloud denotes atmospheric instability in western Nebraska. You can see it coming for a hundred miles or so out there in Nebraska, freeway bearing northeast and quickly-mushrooming anvil cloud bearing southeast, aiming to meet in another hour right where you have a motel reservation. It’s hard to imagine anything could sneak up on anyone on the plains, where you can see forever because the corn doesn’t obstruct a single sight line. No surprises. Just enormous storm clouds that seem to stalk you, perhaps menacingly, but that’s anthropomorphizing, as anyone can tell you that storms just barrel in without stalking. Bright, they are. Cumulonimbus (Cb) cloud tops are full of ice crystals reflecting the brilliant sunlight, tricking you into thinking it is a Safe Thing when its Latin derivation suggests otherwise: cumulus “heap,” nimbus “storm/rain.” One look at these monstrous upwellings of air and water vapor and you sense that its unsettled nature will likely bring precipitation. Dangly clouds are not my favorite. 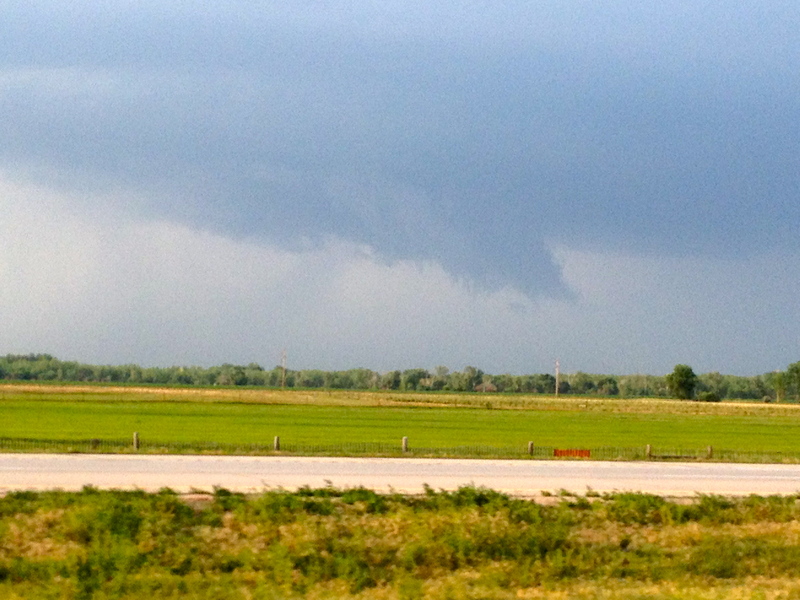 Fractus clouds (scuds) are small, ragged cloud fragments that are usually found under an ambient cloud base. They form or have broken off from a larger cloud, and are generally sheared by strong winds , giving them a jagged, shredded appearance. Fractus have irregular patterns, appearing much like torn pieces of cotton candy. They change constantly, often forming and dissipating rapidly. They do not have clearly defined bases. Thirty minutes later, this towering giant was so electrically charged that I counted 28 flashes of strobe-like lightning in 60 seconds. 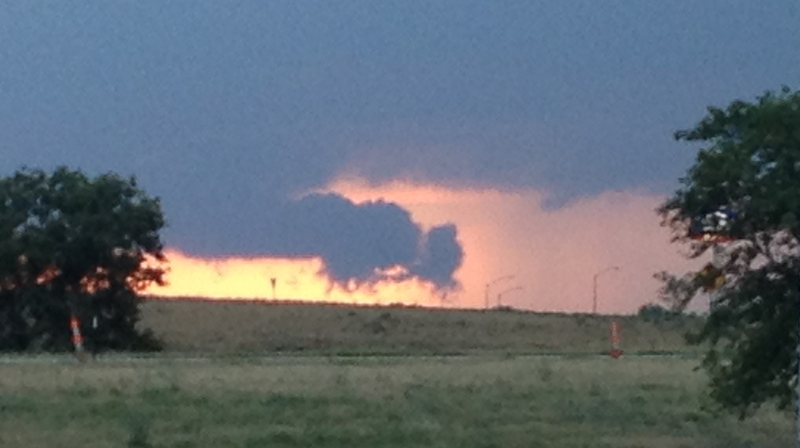 It felt alive, some sci-fi monster rumbling in its innards, ions and updrafts and unstable air converging on North Platte just outside my motel room. I stood alone at the west-facing window and trembled involuntarily, several hundred megawatts of electrical power staring me in the face; until it weakened, there would be no sleep.